A vacant lot between the Naked River Brewing Co., right, and First Tennessee Pavilion is to hold a three-story apartment and office building. Developer John Wise is seeking approval for a setback modification for a proposed three-story apartment and office building at 1795 Reggie White Blvd. The request is to be heard Nov. 8 at 1 p.m. at the Development Resource Center on Market Street by the Form-Based Code Committee. Chattanooga developer John Wise is adding more apartments around Finley Stadium with a new three-story building planned near First Tennessee Pavilion. "They'll be executive-level apartments, really high end," he said. "They'll have a nice balcony overlooking the stadium." The four one-bedroom units will rent for about $1,300 each monthly and take up the top two levels of the building at 1795 Reggie White Blvd., Wise said. The ground floor of the 6,000-square-foot structure, estimated at about $750,000, will hold office space, he said. "It's a good location," said Wise, who recently opened the 179-unit Henry Lofts apartments on the other end of Finley Stadium on Chestnut Street. He's hopeful of starting work on his newest building, located next to the Naked River Brewing Co., within about 45 days. First, he's seeking approval for a setback modification for the building from the city's Form-Based Code Committee on Nov. 8. Chris Thomas, executive director of the Stadium Corp. that operates Finley and the pavilion, said there's a lot of building going on around the stadium. In addition to the Henry apartments, a Nashville developer is constructing a $20 million, 174-unit building nearby at 2108 Chestnut. A couple of blocks north, the 1400 Chestnut apartment building with 210 units near Finley recently opened. Also, a multi-level office building across Chestnut is underway. In addition, a Knoxville developer is building a $15 million, 139-unit apartment and retail project at Broad and West 17th streets about a block from Finley. Despite all of the surrounding apartments, Wise said he's planning still more apartments next to the Henry, though he doesn't expect to start work on those for about a year. Thomas said it's premature to know how all the new building will benefit or impact Finley. "Progress and investment is typically good, but sometimes filled with bumps in the road," he said. Naked River Brewing on Reggie White Boulevard is slated to open Sunday in a restored, Wise-owned building believed to be one of the city's oldest, dating to around 1875. 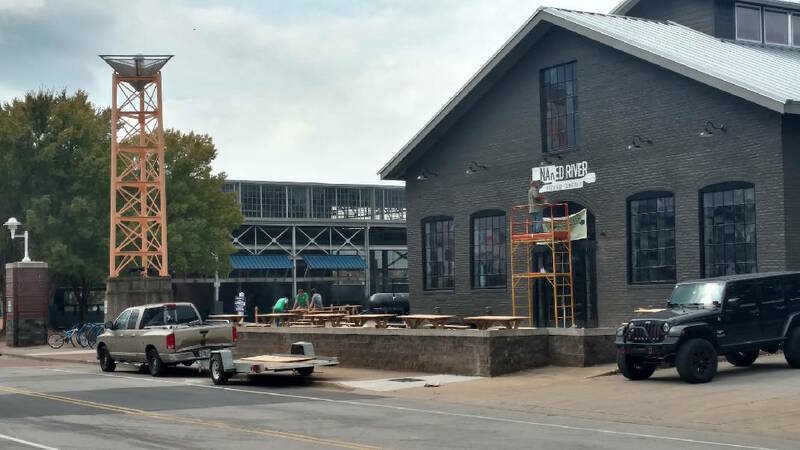 The operators of the new craft brewery, barbecue restaurant, and beer garden said they like the location across from Finley and next to the pavilion where Chattanooga Market is held. Naked River is the result of years of dreaming by a group of friends — Jake Raulston, Nathan Woods, Michael Robinson and Trey Trundle. The brewery will serve Texas-style barbecue including smoked brisket, sausage, turkey, ribs and pulled pork. The craft beer offerings will initially include an India pale ale, a lager, a wheat beer infused with tea, a lite Pilsner-style beer and a Moon Pie Stout, according to Naked River Brewing. "Tasting is believing, and we cannot wait for Chattanooga to taste what we've brewed and cooked up," Woods said.